What is "Ars Vivendi" going to do? We need to know this era, people with disabilities and/or illness, and mental disabilities in the era. This volume mainly consists of 1) the long interview to TATEIWA Shin'ya (interviewer: AMADA Josuke), and 2) special feature: "psyche". 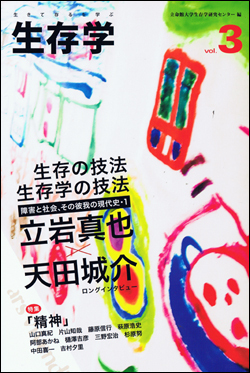 Long Interview: TATEIWA Shin'ya and AMADA Josuke　"Ars Vivendi: The Contemporary History of Disability and Society (1)"
01　YAMAGUCHI Maki "A Study on the Bottleneck of Diagnosing Disease Name in Memoirs of People with Autistic Disorder: Why Do they Try to Talk about "False Step"? 02　KATAYAMA Tomoya "About the Discourse on Autistic Culture in the Age of Neoliberalism"
03　FUJIWARA Nobuyuki "Prevention of 'Medicalized' Suicide Prevention Methods and Emphasis of Duties and Responsibilities of Family Members: Its Ideological Formation"
04　HAGIWARA Hiroshi "The Image of People with Mental Disabilities in TV Dramas: From 'Lunatic' to "'Mental Illness'"
05　ABE Akane "The Eve of Mental Health Reform in Japan: The Movement toward the Kanazawa Conference of the Japanese Society of Psychiatry and Neurology in 1969"
06　HIZAWA Yoshihiko "Affinity between Law concerning Medical Care for and Protective Observation of a Person who Seriously Injured Others in a State of Mental Incompetence and Social Work"
07　MINO Koji "What Is the Meaning of Work in the Clubhouse Model?" 08　SUGIHARA Tsutomu "Viewpoint on Training for Students Studying Psychiatric Social Work Based on Resilience: Suggestion from Assertive Community Treatment Activities"
09　NAKATA Kiichi "Study on Various Definitions of Self-help Groups: From the Viewpoint of Visibility and Imaginativity"
10　YOSHIMURA Yuri "Social Work Profession Education with the Participation of Mentally Disabled People: Qualitative Analysis with Users of Mental Treatment on Interviews in the Treatment"
01　SATO-ROSSBERG Nana "International Conference 'Translation Studies in the Japanese Context' and Teaching Experience at Translation Research Summer School"
02　UEMURA Kaname "The 2nd Workshop 'The Mechanization of Empathy in Health Care'"
03　HIDAKA Tomoo "Fruitful Visit to Italy: The Workshop at the University of Bergamo in Italy"
04　OKADA Kiyotaka "'La Francophonie Littéraire: Un Archipel En Devenir' by Lise Gauvin"
05　SAITO Taku "Global Justice, Basic Income, and Linguistic Justice"
06　TANIFUJI Makoto "Organizing the International Conference 'Bonds and Boundaries: New Perspectives on Justice and Culture'"
07　NAKAKURA Tomonori "MAUSS and Tarde: Various Areas of Social Science and Economic Matters"
08　NISHIJIMA Kazuhiro "History Is Narrative, then Who Owns the Narrative? : Presentation at the Special Public Symposium 'After Metahistory: Lecture on Postmodernism by Professor Hayden White'"
09　HIRAGA Midori "Report on Special Lecture Series 'An Introduction to Disability Studies' by Professor Colin Barnes"
10　MOTOOKA Hirokazu "Workshop with Professor Thomas Pogge"
11　YOSHIDA Sachie "Participation of the Japan-South Korea Cooperative Research Project: My First Overseas Research"
Although I do not praise people with mental disabilities entirely, they have spent a lot of time and efforts on things that were not beneficial very much or at all and consequently they were exhausted. In fact, some of them continued running hospitals in spite of vaious difficulties, including suffering themselves, to a miximum extent and others passed away earier than what was expected. I believe, we should at least record what has been done. I believe their efforts have made some results - more than nothing. I think even though some people criticize such "reforms" or tried to stay away from them, they also recognise their achievements to some extent. Some things - although it is difficult to evaluate them - have been done and I believe that should be also recorded. And I believe now is the time for us to do such recordings. I discussed it in the long interview (Tateiwa and Amada 2010) of Ars Vivendi Vol. 3, which features mental disabilities and mental health. Most of the people who I have focused on were born in the 1920s and 1930s. As I mentioned before, some of them passed away in last several years. In the application for grants-in-aid for scientific research (A) I wrote, I insist that many things be forgotten and lost forever unless we interview its related people or gather related materials now. I also feel those people would like to talk about themselves, or would like us to record their lives, although they also have some hesitation in talking about themselves. I think such people who had hesitation or self suppression and kept quiet before, now begin to write about themselves or began to talk to us about themselves. They might feel that unless they take any action, all important and necessary records or information will be lost. I think this must lead to several publications concerning the theme in these years. In that sense, now is the good time to record their lives. In other words, we will lose the records unless we record them now. However, actions have not been taken enough. Actually, there have been few previous studies on the theme. One of the reasons is that many people do not think that there can be such research. In addition, the theme has fractiousness.